On Sequential Tart, Roz Young says of HELLBOUND II: “This is an anthology created by people who find truth in horror, and will be enjoyed by anyone who shares a passion for the genre.” READ THE WHOLE REVIEW! At Spandexless, meanwhile, David Anderson wrote (of the same book): There’s a lot of talent condensed into this volume, both in terms of writing and art.” READ MORE! Oh, and COLD WIND has gotten some attention too! In an entertaining roundup on the Boston Comic Con from Bleeding Cool, Louis Falcetti calls it “one of the most interesting, fun, gorgeous books I’ve read in a long time.” A lot of other great local comics are mentioned, so…. READ THE WHOLE ARTICLE! That’s where Ninth Art Press is going to be these next two weekends, tabling with other members of the BCR! First Boston Comic Con on September 21-22, then MoCCA in New York on the 28th and 29th! With warm-off-the-press copies of Hellbound II, and a new, comic-book sized edition of Cold Wind! 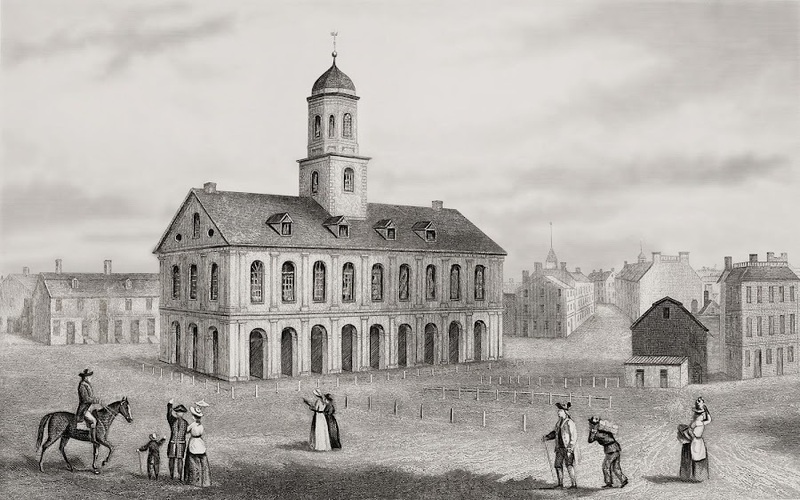 The crowds were modest at the first Boston Comic Con, held at Faneuil Hall on November 5, 1773 (note couple cosplaying as horse, left). How things have changed-- don't miss this year's show!